Patricia MacLachlan reminds me of the ancient images of the well that never runs dry. She continues to turn out one children’s book after another, and each one has the same quality of kindness, simplicity, and goodness. And yet, each story is slightly different, bringing out yet another facet of human nature and children. This most recent children’s book brings up the question of the purpose of our life. Is it enough to be content with family and simple things, or do we need fame and glory to be happy? 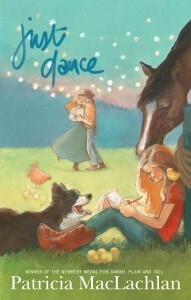 Of course, the answer is already embedded in the question, but MacLachlan allows her young readers to discover this through the eyes of Sylvie, a fourth-grade girl living on a farm, and ready for a bigger life. I adore each children’s book by MacLachlan’s, and there are many now listed on this website. The main reason I love them is that I can let out my breath, and know that as I read it from beginning to end, I will only encounter the truth of life, which may be at times uncomfortable, but never mean or unkind. She is one children’s book author who I can count on for an uplifting read. I hope that many young children get to read her books before they reach the age of cynicism. I think the target audience is around 7 to 9.